I have created several pendants that are all unique. The designs are showcased on a necklace comprised of complimentary beads. The clasps will vary dependent upon the design. Upon request any necklace can be made in the color of your choice, the length that you want and adorned with the clasp of your choice. Please contact me with any questions at kp.forney@gmail.com. 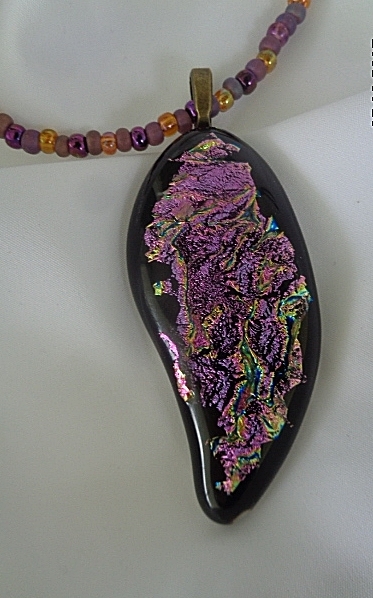 This dichroic necklace is stunning. The dichroic glass is mounted on a black canvas and covered with a thin sheet of clear glass than fired to accentuate the colors. The multiple colors in the glass sparkle when reflecting light. Each necklace is cut from a individual piece of glass assuring that no two necklaces are alike. Large misty green circle with amber accents. Very unique. Custom orders only. This dichroic beauty is an ideal gift for any musician. The hand cut glass note measures 1" by 1" and is adorned on a hand beaded 18' necklace. This beauty measures 1 1/2 inches in width . This unique hand cut dichroic seahorse will capture every heart.th. This beauty measures 2" by 1/2'"
Picasso inspired necklace has a 4” long design on a 20” black beaded necklace. The clasp is a silver toggle. A custom “one of a 1 kind“ blue dichroic mosaic pattern. A real beauty in blue with a 24 inch hand beaded necklace. Silver toggle closure.